Before coming on board as a member of the Groutsmith franchise family, Bob Noeske built himself a career working in another area of home service: the painting industry. Spending the bulk of his prior experience in a number of customer-facing roles, he built a strong foundation of interpersonal experience he later applied to his role as a Groutmsith franchisee showing customers how the Groutsmith’s uniquely specialized service can make a huge difference inside their homes and businesses. Ready for a shift in his professional life, Bob reached out to a friend involved in franchise sales to explore what opportunities were available to him in the Madison area. 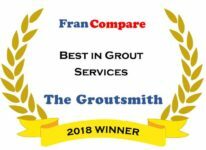 Intrigued by the unique benefits The Groutsmith had to offer, they teamed up to move forward with the first and only Groutmsith location in the state of Wisconsin. Instead of opting for the secondary services of a carpet cleaning company, customers are thrilled to hear there’s a local service that devotes all of their time, energy, and expertise to tile and grout restoration. Recalling the onboarding process he went through prior to opening his business, Bob says his in-person discovery and training sessions were simple, informative, practical, and one-on-one. Most notably for Bob was the thoroughness of the hands-on training sessions in the field. Today, Bob can continue living flexibly by writing the work schedules that he wants to operate on. Stepping back into the shoes of someone still shopping around for the perfect business opportunity, Bob says those who are serious about owning their own franchise should focus their growth strategy on hiring wisely. “It’s key,” he says. “Find good employees, pay them fairly, and you’ll do well. Once you’re there, things fall into place and success comes naturally. As for the future of Bob’s Groutsmith business, his sights are set on growth far into the future.